Not specified in Biblical text. The fire surrounding the falling eagle provides the light for his scene. The sun (unseen, behind & to the left of the viewer) also illuminates the scene. None, unless you count the eagle! This is an my visual interpretation of the phrase in verse 4, which really caught my eye. The poetic description of an eagle amongst the stars falling was just too good to pass up! It was fun making the eagle look like a meteorite falling towards the earth below it. I found photo reference for a bald eagle coming in to land, & rotated the picture 180 degrees so it looked like it was falling instead of flying. Then I draw the outline drawing of that, with changes to wing position, taloned foot & leg positions, & added various other elements such as additional feathers. I decided to make the eagle red, because the Edomites (about which this prophecy concerns) took their name from the Old Testament character Esau, brother to Jacob. Esau (aka Edom) was born red, &/or was hairy, &/or had red hair, hence his name. I found some nice photo’s of the earth & moon from space which form the basis of my drawing. 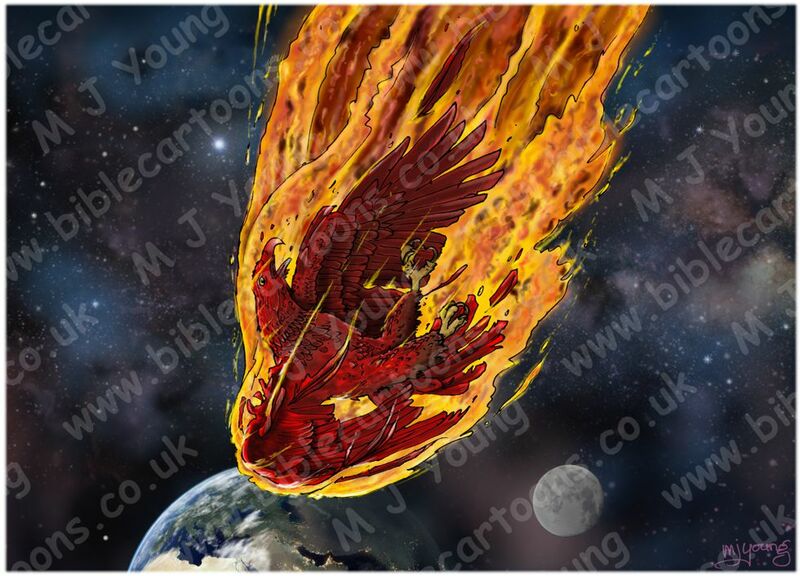 I have heavily simplified the colouring (& added new clouds & weather systems to the earth), so these bodies don’t detract too much from the focus of attention: the fiery eagle. Neverthless, I felt the moon was still a bit of a distraction, due to its brightness, so have darkened it & reduced the contrast of its surface features, so as to make it recede into the background a bit more.